With a seating capacity of over 100,000, the slogan Everything is Bigger in Texas applies to the Texas Longhorns stadium. 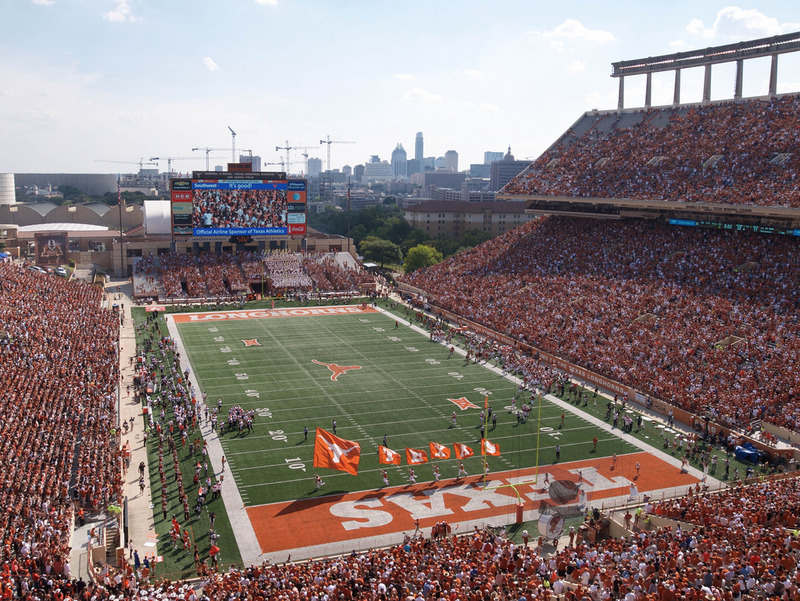 After playing more than two decades at Clark Field, it was time for the Longhorns to look to the future and build a new stadium for the Texas Longhorns. Led by Athletic Director L. Theo Bellmont, the University decided to construct a new stadium in the early 1920s. 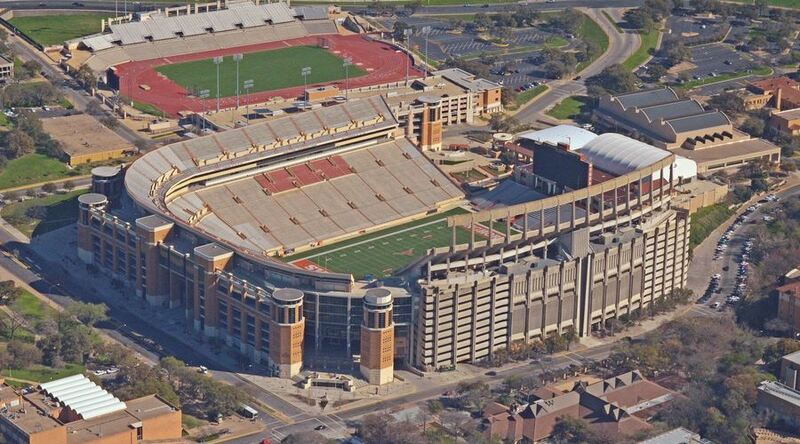 The stadium was built in 1924 and the Longhorns played their first game at Memorial Stadium on November 8, 1924. At a cost of $275,000, Memorial Stadium had a seating capacity of 27,000. As interest in the team increased, the stadium was expanded. Two years after opening, Memorial Stadium was expanded on the north side to give it a horseshow configuration increasing the capacity to 40,500. By the 1940 season, the east and west grandstands were expanded and the grandstand on the south side of the field was built, allowing 60,000 fans at Memorial Stadium. Lights were added to Memorial Stadium in 1955 and Astroturf replaced the grass field in 1969. The upper deck was constructed in 1971. Fans attending games at Memorial Stadium in the 1990s saw a plethora of changes. In 1996, the playing field was changed to grass and a new video/scoreboard was added. Memorial Stadium was officially renamed Darrell K. Royal – Texas Memorial Stadium in 1996 after legendary Longhorns Coach Darrell Royal. The following year, 14 suites were added on the west side and in 1998, the 5,000 seat upper deck was constructed on the east side along with 52 luxury suites. In 1999, the track around the field was removed and the field was lowered three feet, allowing for additional seats along the field. After the 2005 season, the Longhorns added a 55ft. high by 134ft. wide video display to the south endzone. It has been nicknamed, Godzillatron, and is one of the largest videoboards in college football. Temporary seating was added in the south endzone in 2006 and expanded for the 2007 season. The 9,000 seat lower deck was added in the north endzone in 2008. Before the 2009 season, construction was completed on the north endzone upper deck. This expansion includes 2,000 club seats , 44 luxury suites and a food court for fans. Fieldturf replaced the natural grass field prior to the 2009 season. After its latest expansions, Royal Memorial Stadium is now the largest stadium in Texas with a seating capacity of over 100,000. Future plans call for the stadium to be expanded in the south endzone increasing the seating capacity to 112,000. Plans for this project have not been approved.